A Family strategy game. Not for Mathematicians. 2 to 4 players. Pi = 3.141592 Board Game:tm is a strategy board game played by 2 or 3 or 4 players. 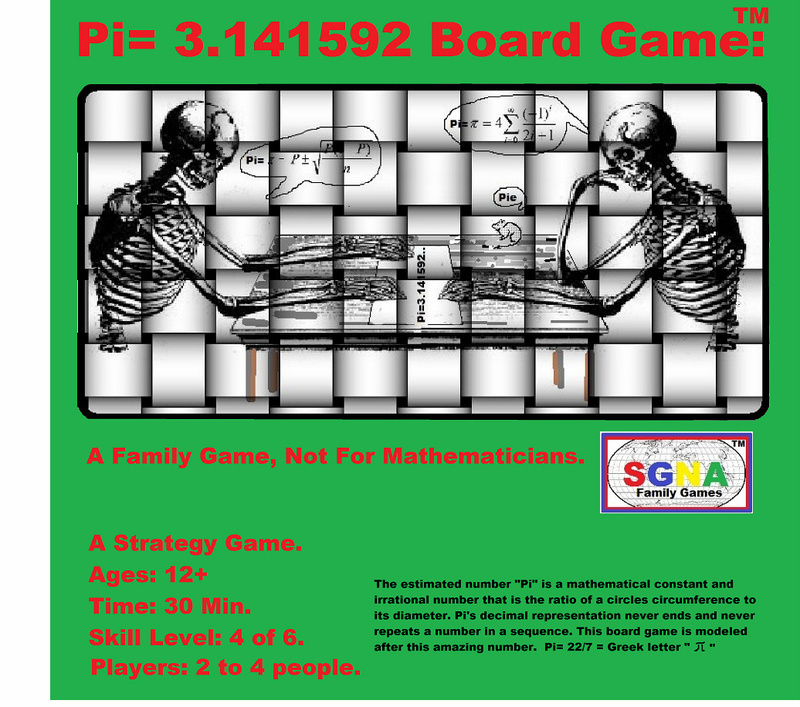 Pi = 3.141592 Board Game is played by players aged 12 to adult. The time to play Pi = 3.141592 is about 30 minutes. Pi = 3.141592 Board Game is played with 56 tiles. The tile sizes are 1.5 inch by 1.5 inch. 8 tiles are labeled on one side with the number “3”. 8 with the number “4”. 8 with the number “5”. 8 with the number “9”. 8 with the number “2”. 12 tiles are labeled on one side with the number “1” and 4 tiles are blank, not labeled. 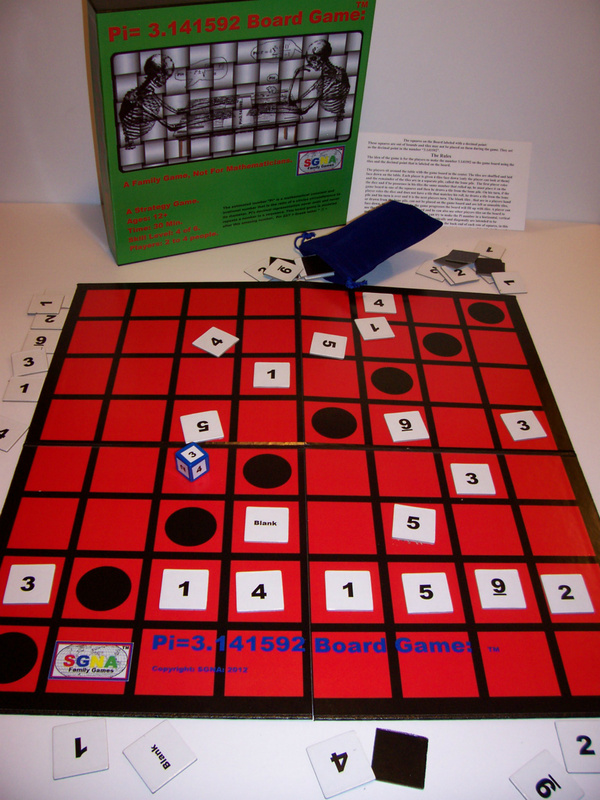 Pi = 3.141592 Board Game is played with one six, new stylised, sided dice. The numbers on the six sides of the dice are: 1, 2, 3, 4, 5, and 9. One number per side. Enclosed is an extra sticker for each dice symbol, encase of loss or application error. These squares are out of bounds and tiles may not be placed on them during the game. They act as the decimal point in the number “3.141592”. The idea of the game is for the players to make the number 3.141592 on the game board using the tiles and the decimal point that is labeled on the board. The players sit around the table with the game board in the center. The tiles are shuffled and laid face down on the table. Each player is given 4 tiles face down [only the player can look at them] and the remainder of the tiles are in a separate pile, called the bone pile. The first player roles the dice and if he possesses in his tiles the same number that rolled up, he must place it on the game board in one of the squares and then he draws a tile from the bone pile. On his turn, if the player roles the dice and does not have a tile that matches his roll, he draws a tile from the bone pile and his turn is over and it is the next players turn. The blank tiles , that are in a players hand or drawn from the bone pile, can not be placed on the game board and are left as unusable tiles, face down, in a players hand. As the game progresses the board will fill up with tiles. A player can use the tiles that he placed on the board and he can also use other players tiles on the board to make the number “3.141592”. The players can try to make the Pi number in a horizontal or vertical. All rows, horizontally and vertically are intended to be continues closed circuit tracks, from the front end to the back end of each row of squares, in this game. If a all the tiles are used and on the game board, with the exception of the blank tiles, and none of the players have created a “Pi” then the game is inconclusive, the game is over and there is no winner. The first player to complete the number “3.141592” has made “Pi” and wins the game.